A few years ago when I was at Myakka River State Park, I was taking pictures at the picnic area across the road from the canopy walk. I happened to notice a group of about 6-8 kayaks coming down the river. One or two were paddling faster and were further along than the rest. When I looked back to see why the group was so strung out, I happened to notice that one lady was a novice. The older woman was SIDEWAYS in the river. Her family and friends were in kayaks on all sides of her...protecting her... shouting out instructions...giving quick words of encouragement as the frustrated woman struggled to find her way in the river. As I watched her frantically trying out the various suggestions, her kayak went from one side of the narrow channel to the other. I couldn't believe what I was seeing. I knew up ahead she would encounter the bridge and all the BIG GUYS that hang out along the banks of the bridge. "How on earth is she going to be able to maneuver through the bridge uprights? What if she hits one of those uprights and overturns? What is she thinking???" I worried. I looked ahead to see if the kayaks in front would turn around to come back to assist. They didn't. The rest of the group formed a tighter cluster around the woman. Perhaps they understood she HAD to control the kayak before she could go any further. Gradually the woman seemed to calm down. Gradually she got the rhythmn of what she needed to do. Together the group paddled their way past me, on their way down the river towards the bridge, and safely through its uprights. 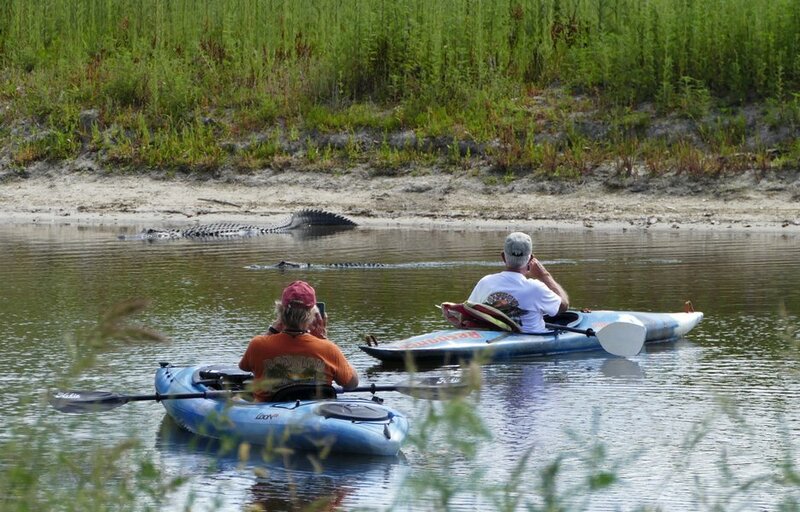 I always wondered if that woman truly understood the danger she was in when she decided to go kayaking on the Myakka River and saw the Big Guys clustered along the bank of the river by the bridge. She was a novice. She had a current to manage. She had a kayak to maneuver through uprights. She had enormous alligators watching. I would have thought that if you are a novice, you would first find a safer place to learn how to kayak. 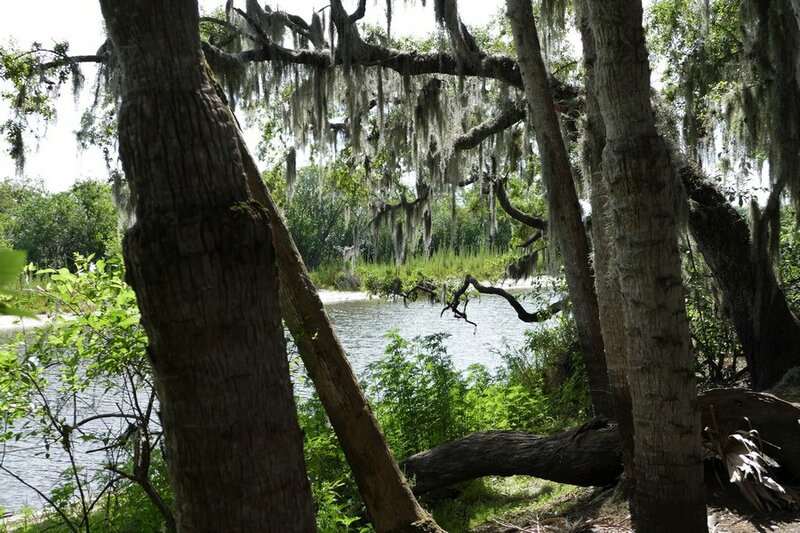 I would NOT get my first experience on a body of water that has current and that is filled with alligators. Since alligators are assumed to be in all freshwater, I would have at least chosen a pond. My assumption would be that there's no current and that there would be fewer alligators. Today I discovered I could toss that assumption out! Today there was a boatload of alligators in the Upper Lake. I know they're always there, but I generally don't see them. Today everywhere I looked, I saw them. If I had decided THIS was the day I was going to learn how to kayak, I would have had a heart attack to have been out on the Upper Lake as a novice kayaker learning the fine art of kayaking.... "What if I hit one of them?" What if one of them hit ME?" Hope everyone has a WONDERFUL NEW YEAR and HAPPY PADDLING if you're a kayaker or one in training! At least I was the only one until a couple of kayakers quietly paddled by. I heard one comment about an alligator on the left and another one on the right. 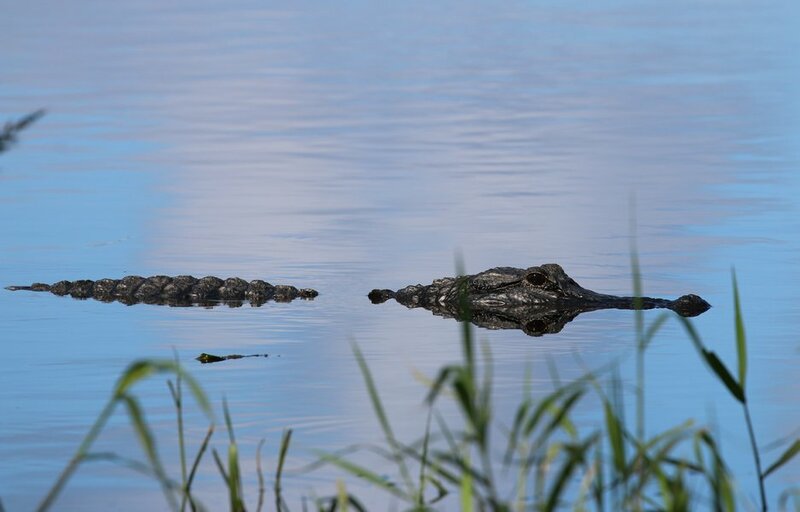 I couldn't see what they were seeing, so I continued my hike and figured I would see the alligators up near the overpass. What a surprise I had! When I reached the overpass, there wasn't just ONE alligator on the left and ONE alligator on the right. There were TWENTY or so alligators out and about. Most were sunning themselves on the bank but there were about 8-10 dog-paddling in the river. A few more entered the water when the kayakers approached. I guess they didn't appreciate the insensitivity of someone disturbing their slumber and perhaps they wanted to show their displeasure. The alligators were never aggressive. They did not swim toward the kayaks BUT in my imagination, they no doubt would doubled-back and come up under the kayaks and. I think I will wait on kayaking, BUT I absolutely envy all those who have had this experience. What great pictures these men must have!! !